FROM INTERSTATE 805: Take the Mira Mesa Blvd (Exit 27) exit. Head east on Mira Mesa Blvd for roughly 2 miles. Turn right onto Flanders Drive and Geocon will be on your left in about 0.4 miles. FROM HIGHWAY 15: Take the Mira Mesa Blvd (Exit 16) exit. Head west on Mira Mesa Blvd for roughly 3.3 miles. Turn left on Camino Santa Fe and then turn right on Flanders Drive. Geocon will be on your right in about 0.2 miles. Menu: Mexican Buffet - Tacos, Rice and Beans, Chips. Cost:	$35.00 for non-members, $30.00 for members, $15.00 for students. if pre-registered by the deadline, $5 extra if you did not make a reservation. Click the SDAG member checkbox on the reservation form if you are a member. RESERVATIONS CANNOT BE ACCEPTED AFTER Monday at noon. Late reservations/cancellations are preferred over walk-ins or no-shows. Fees payable at the meeting or pre-pay with PayPal. There also will be a phone credit card reader at the meeting. IF YOU DO NOT MAKE A RESERVATION, WE CANNOT GUARANTEE YOU A MEAL. make sure the SDAG secretary has your correct e-mail address. "Student Presentations and Anne Morgan - Earthen Art/Geoglyphs"
Abstract: Changes to coastal systems due to human modifications (e.g., dams, urbanization) and anthropogenic climate change have altered natural systems of sediment dispersal and models of future climate change show impacts to the coast continuing and even accelerating in the future. Our ability to predict those impacts and implement management strategies to adapt to change could be aided by a better understanding of how coastal systems have responded to similar changes in the past. We collected 6 sediment cores containing ancient San Diego River delta deposits from Fiesta Island in Mission Bay, to interpret river and coastal system response to past events including floods, fires, and seismic events. Previous work in southern California estuaries has demonstrated that a record of climate change is preserved in these depositional environments. Nevertheless, these studies have focused on longer time - scales and have not yet resolved a detailed event record for the region. Preliminary examination of the cores revealed complex stratigraphy with variations in grain size, amount of oxidation, mineralogy, and biogenic material. There are also finely laminated deposits, as well as layers with structures and erosive surfaces indicative of rapid deposition. We hypothesize that the sediment captured here records changes to the delta system through time and may include several event deposits that could help reconstruct a climate and seismic record for the region. As a starting point, a chronology has been established through radiocarbon dating that indicates a sediment record of ~1800 yrs was captured in the cores. Using the radiocarbon dates an age model will be created to assess changes in sedimentation rate and ages of potential event deposits. Further analyses to reconstruct the delta's sedimentary history will be performed including detailed grain size analysis, particulate charcoal measurements, paleontology identification, and pollen analysis. Abstract: In active volcanic regions, ground displacement measurements can be used to detect signals of a changing magma source. Traditional measurements made by ground-based instruments such as GPS and tiltmeters are not suitable for remote locations where instrumentation is infeasible, so in order to study these locations it is preferable to use a satellite remote sensing platform. Interferometric Synthetic Aperture Radar (InSAR) is one such technique and has revolutionized our ability to collect this type of data by mapping ground deformation at millimeter level accuracy across a large and uniform spatial scale. In this study we use InSAR to observe surface deformation of Okmok Volcano. Okmok Volcano is an active shield volcano in the Aleutian island arc that last erupted in 2008, sending up a 15 kilometer ash plume that interrupted trans-Pacific flights'. For this study we use Sentinel-1 SAR satellite data collected over Okmok to produce a time series of 237 interferograms spanning early 2015 to the present. Each interferogram is constructed from two SAR images of Okmok collected at different dates. Differencing these images results in an interferogram showing how much the ground moved up or down between these dates in the form of radar phase (see Figure 1). The interferograms produced in this study show a total maximum displacement of 19.3 centimeters of the volcano's surface towards the satellite. The radial symmetry of the inflation pattern on Okmok suggests that the magma source causing the inflation can be represented by the Mogi model, which allows for estimating the surface deformation of a volcano based on the depth and volume-change of its assumedly spherical magma chamber2. Here, using our measurement of the volcano's surface deformation, we inversely implement the model to solve for the magma chamber's best fit depth and volume-change. Doing so results in an estimated magma chamber depth of 3 kilometers and an increase in volume of 0.008 cubic kilometers (approximately 3200 Olympic swimming pools). These results agree well with previous studies of Okmok in which the depth and volume- change of the magma chamber were modeled to be between 2-4 kilometers and 0.005 cubic kilometers, respectively1,2'3. From this as well as the good fit between our observed and modeled data, we conclude that this model sufficiently explains the surface deformation observed. Over the next year we plan to create a time series of Okmok's magma chamber growth, apply this process to other Aleutian volcanoes, and compare the results to previous publications. Abstract: The El Nino Southern Oscillation (ENSO) is the largest reoccurring global climatic phenomena on interannual timescales. With oscillations of every 3-7 years, ENSO shifts precipitation patterns and sea surface temperatures across the temperate regions of the globe and drives interannual climate variability across the globe. Our knowledge and expectations for future ENSO events can be greatly advanced by clues of the modes and mechanisms of ENSO events in the geological past. In this study, we use a unique ultra-high-deposition-rate marine sedimentary sequence (IODP Site U1477) drilled off Mozambique at the output of the Zambezi River, to investigate the proxies for changes in sea surface temperature, salinity, precipitation and sea level over the last 100ka. The overall goal of this work is to understand interannual variability (El Nirio teleconnections) and its imprint on the hydroclimate variability of S. Central Africa. The La Niria phase of the ENSO system affects the hydrology of S. Central Africa; the region currently receives anomalously high precipitation during a strong La Nina event. Increases in either the strength or recurrence of La Niria results in large flooding events and increased output of freshwater at the study site. Flooding events in this region are recorded as negative excursions in seawater 6180 values and as increases in concentration of incompatible elements such as barium that are incorporated into the shells of the foraminifera. Barium in coastal marine carbonates has been used as a proxy for riverine discharge, because it is more abundant in continental crust; thus the rivers that carry the dissolved weathering products of this continental crust also feature elevated concentrations of barium. Though the sediment sequence does not explicitly resolve interannual variability (the resolution is quasi-decadal) we can measure increases in discharge as a negative skew in the histogram of individual foraminiferal 6180 values or analogously, a positive skew in barium concentration of individual foraminifera. In addition to glacial-interglacial comparisons, we also resolve hydrologic changes across the global climatic events known as Henrich Stadials periods of intense cooling and iceberg discharge in the North Atlantic Ocean that perturbed the global heat balance and that involved a southward shift of the Intertropical Convergence Zone. These global climate transitions offer a unique experimental platform to document the response of the ENSO system to changing global climate state. The Heinrich events are particularly valuable in that, unlike glacial-interglaical cycles, there was very little sea level change across these events that might influence the patterns of sediment deposition on the Mozambique margin. The results thus far suggest that the stadial events (including the Last Glacial Maximum and Heinrich Events) were in fact characterized by enhanced discharge from the Zambezi catchment. Abstract: Across the deserts of the American southwest are one of the largest concentrations of geoglyphs outside of Peru's Nazca Lines. These ancient Native American works of earthen art can be up to hundreds of feet long, and yet are often invisible until viewed from above. Before drones, GPS, or GoogleMaps, photographer Harry Casey began a unique archaeology project. Armed with nothing more than topographic maps, 35mm film cameras, and his beloved Piper J3 Cub aircraft, Casey spent thirty-five years documenting the region's geoglyphs before natural erosion and human intervention could destroy these fragile sites. Here, for the first time, is a visual record of these beautiful and mysterious, little-known features. Anne Morgan: Born and raised in New Orleans, Louisiana, Anne Morgan took her lifelong love of history and turned it into a career by attending Simmons College in Boston, Massachusetts, to get a Masters in Library and Information Science, focusing on archives. She was hired as the Head Archivist/Curator at the Imperial Valley Desert Museum in Ocotillo, California, and promptly fell in love with the desert around her. 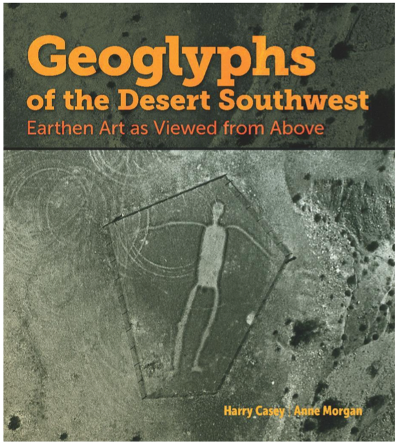 While working at the IVDM Anne met Harry and Meg Casey and what began as an archival project on Harry's nearly 10,000 aerial images became a friendship and partnership as she helped edit Harry's original manuscript into a published book. Meetings are usually scheduled for the 3rd Wednesday evening of the month. Meeting information on this website is normally updated the second week of the month. If you have any information, announcements, ads or suggestions for an upcoming newsletter, please submit it to Heather Reynolds, (2019 SDAG Secretary). Any news regarding upcoming events that may be of interest to the Association or news of your business can be submitted. The submittal deadline for the next SDAG newsletter is the last Friday of the month.